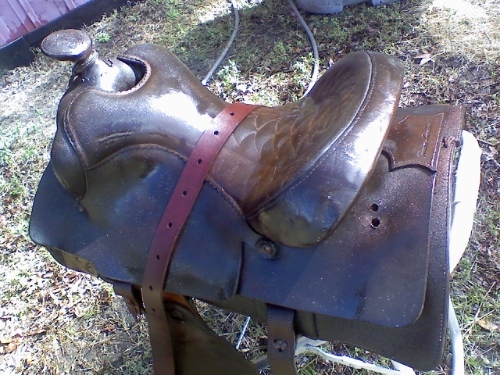 The time has come to clean our vintage saddle. 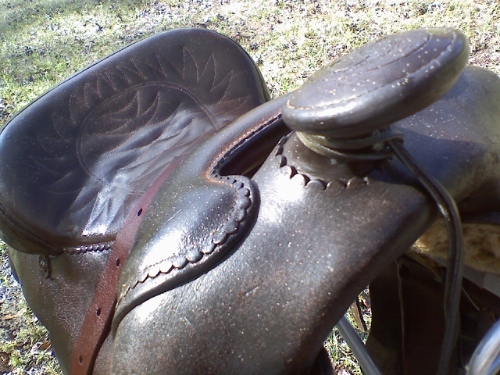 I was assured by our trainer/friend, Gary Adams (Quest Horsemanship) that it was neither too heavy or in ill repair. It even fits Cass. Years of dirt have built up and there are a few pieces that need to be replaced but all in all, it’s in excellent shape for being an old-timer. 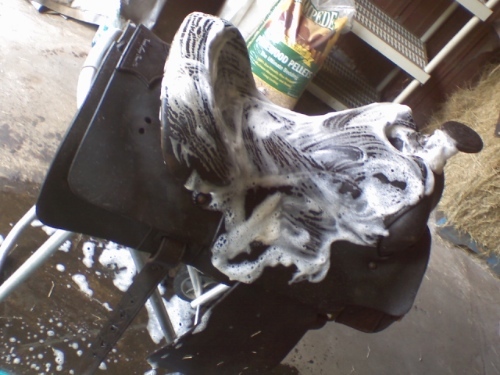 I had no idea how to clean a leather saddle. 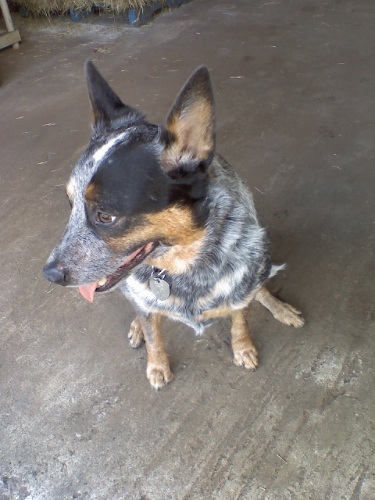 He schooled me and assured me there was no way I could really hurt it. So here we go! Eva awaits more instruction after gathering needed supplies. 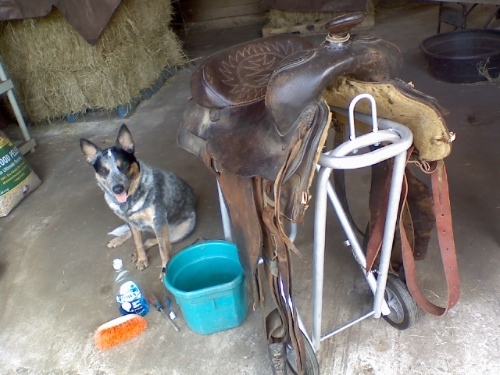 He told me to dunk the saddle (several times) in water! 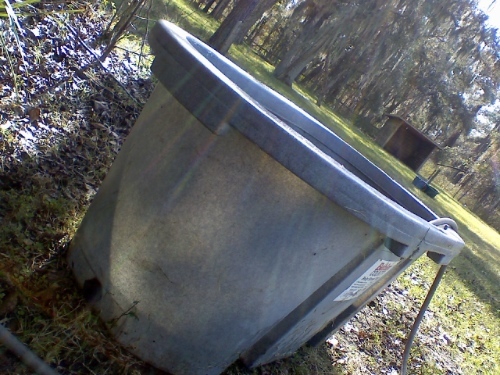 I filled our large water trough and prayed this was really what I was supposed to be doing. The water immediately turned brown. I made sure to dunk it and dunk it again and dunk it one more time, covering it completely. If I thought it was heavy before this… the water must have added another ten pounds! 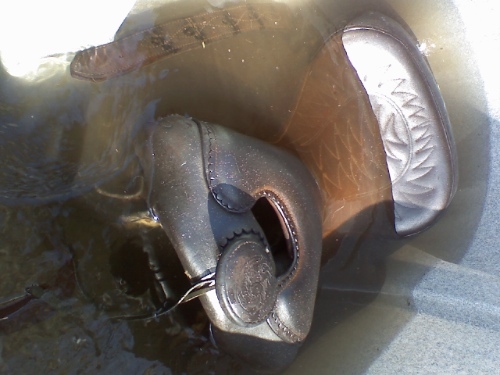 No turning back now, my saddle was soaked. A good scrubbing was next. 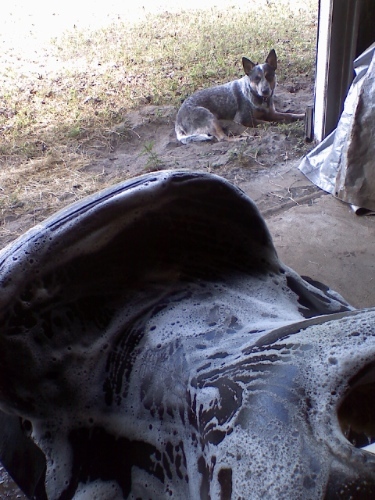 Dawn dishsoap, safe enough for baby ducks, safe for my saddle. I got brave and removed pieces that were rotten. 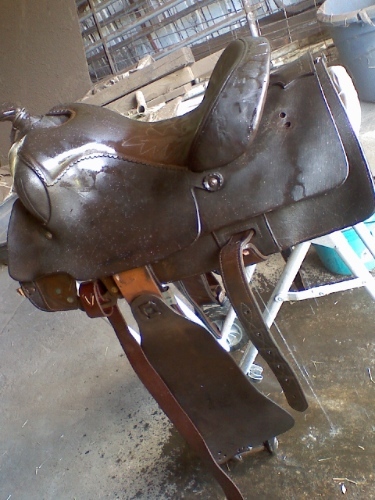 This piece shows where I believe the saddle was made. There’s a store in TX called Luskey’s/Ryon’s. I was thinking it was made in the ’70’s. Gary thinks it may even be older than that. Lots of grime came off, not sure if I will need to do another scrub or not. 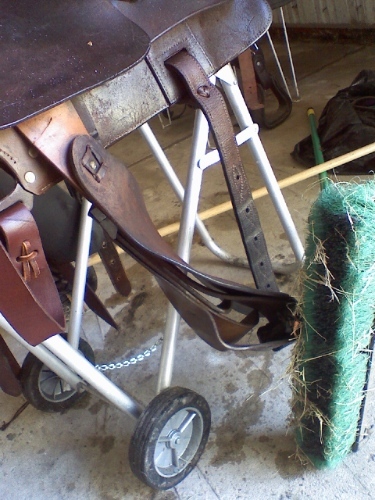 Gary told me to use brooms to position the stirrups so the fenders would dry in the proper position for riding. The next step in our process will be oiling it once it’s had time to dry. I feel much more confident than when I began this task. 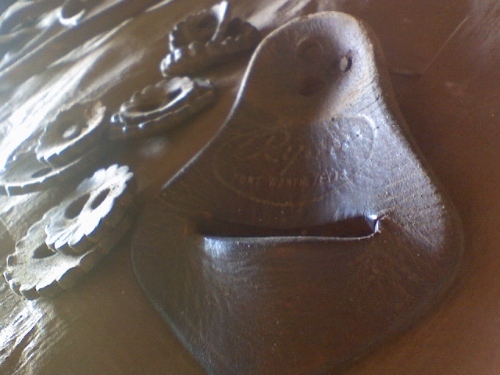 Once the saddle is ready I’ll have no more excuses, will I? getting ripped off and you surely don’t want that. Avoid buying a lemon by looking through these great tips and tricks regarding car purchases. Hi it’s me, I am also visiting this web page daily, this site is genuinely good and the viewers are actually sharing fastidious thoughts.